I carried this tree in through the door and the first thing my boyfriend said was, “Why’d you buy a cabbage tree?” I insisted that the tree is beautiful, was priced excellently ($22! ), and that I couldn’t live without it. He then told me that he thought it was “uncool,” but I don’t care. I love my cabbage tree. 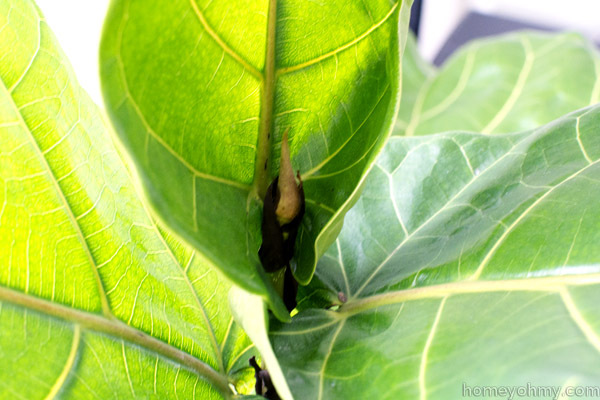 Fiddle leaf fig trees are being talked about everywhere in the blogosphere right now. Even as I carted it to the checkout at Home Depot, two people came up to me and asked what kind of plant I was purchasing. The fiddle leaf is charming us all! It’s currently sitting in this corner of my living room and I always knew it would be going there. That keyboard set up next to it is my boyfriend’s, which he hasn’t played ONCE since we moved in and he refuses to let me replace it with a bar cart (C’mon! Everyone needs one of those!) I’ll keep trying to make that happen… we’ll see. I planted the tree in a copper pot which is so perfect in size that I’m thinking I should probably go with one bigger… That’s with the assumption that I’ll keep the tree alive long enough to where it will outgrow the pot. Apparently the number one killer of fiddle leaf fig trees is over-watering, which is how I’ve killed many other plants. I’m going to be extra EXTRA careful about that with this one, but I’m glad to see that there already seems to be a new leaf coming out! That is what’s happening here, right? Whatever it is, it’s making me hopeful for the future. 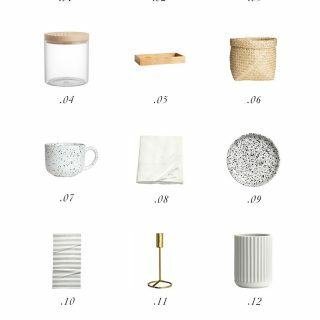 If you’ve got any care tips, cautionary tales, or general thoughts on the fiddle leaf, I’d LOVE to hear it in the comments below! 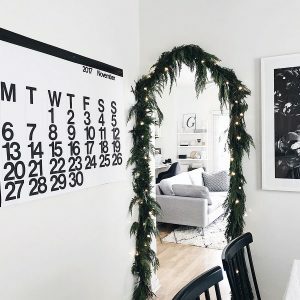 Anything you can tell me to help mine survive or prove that my boyfriend was wrong about the tree being uncool would be greatly appreciated <3. My plant problem is that all of the sunny windows are occupied by cat trees (those spoiled kitties), so I don’t know if I can fit a tree. 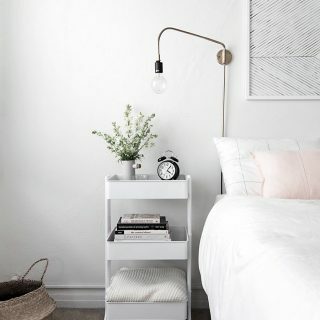 It looks lovely in your space! 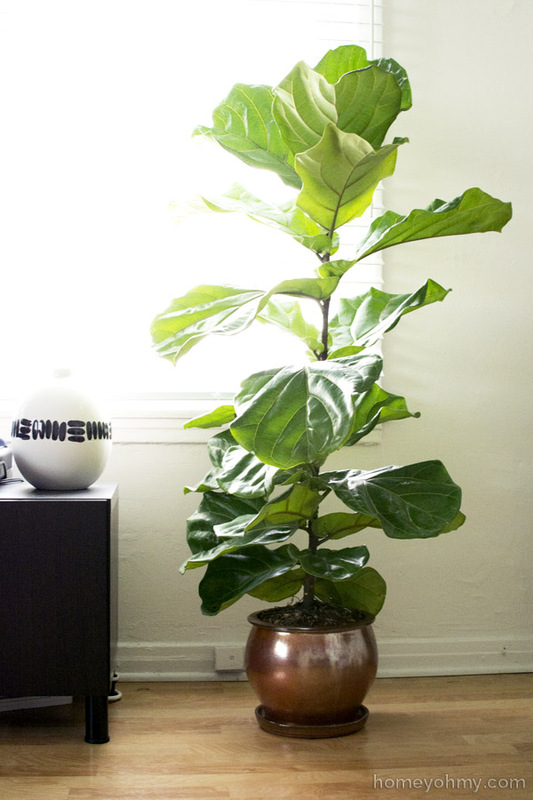 I don’t know the specifics needs of fig trees, but I’ve used this guide to care for my plants and it has REALLY worked: http://powazek.com/posts/2352 Drainage is really important, and if the tree is too big to move when you water, you may want to think about siphoning off the water that trickles into the saucer with a turkey baster. Beautiful! I’ve neverhad a green thumb but would lobe to have some greens in the house! I don’t have any tips because I kill every plant in sight :) But I’ve always loved the fig trees. It looks great in the corner of your living room! I think it’s beautiful and I love the pot you have it in, although I guess a bigger one may be better. I’m terrible when it comes to plants and keeping them alive :( Plus it doesn’t help that my cat eats them and gets sick. Really annoying. Oh and you are waaaaay cool in my book! I too do not have a green thumb, but I love the “cabbage plants”, too. I bought one at Ikea this winter for $13.00. I’m still struggling to keep it alive. Thanks for the encouragement I now feel. I will Not kill this plant!! I have a fiddle leaf fig tree that is now 7 ft.tall. I have cut it back twice & given starts to friends. I now have it outside in the shade & it is getting new shoots every day. I’ll be bringing it back inside soon as I live in Northern Mn. I have 2 of these plants in my home and the edges of the leaves are turning brown and leaves are falling off. Why?!? Unfortunately I haven’t been able to figure that out. Mine died a long time ago and my best guess is because of not enough sun! Please, where did you buy this little guy at? Hi. I love your tree. I have never had a green thumb, but love plants. When I moved into my new house, I vowed to learn how to take care of plants. I started off with a snake plant and a dracaena, and stag horn fern, after not killing them for a year. I took pictures of my living room and went to the nursery where I buy my plants and asked for advice for the best spot where to place it. I was told not to put in the corner where I wanted it, because it would receive too much direct sun, it was best to put it on the opposite side, where it would get plenty of indirect light and out of any draft way. As far as watering it, I was told to wait for the first two inches of the soil to dry out, I use a hydrometer and have learned to water every 7-10 days…I take it into my shower and give it a good bath with lukewarm water and let it air dry overnight. I clean the leaves with a damp cloth to remove the dust ( I tell him how handsome he is while doing this…maybe a little on the loony side, but I also believe in talking to your plants it helps the leaves breathe better and I use a seaweed extract or fish emulsion fertilizer during growing season only and so far so good. My tree is alive and well. I also just planted outside a Japanese Maple and he is beautiful, hoping it stays that way. Wish me luck…and good luck with your cabbage tree, he is absolutely gorgeous!!! 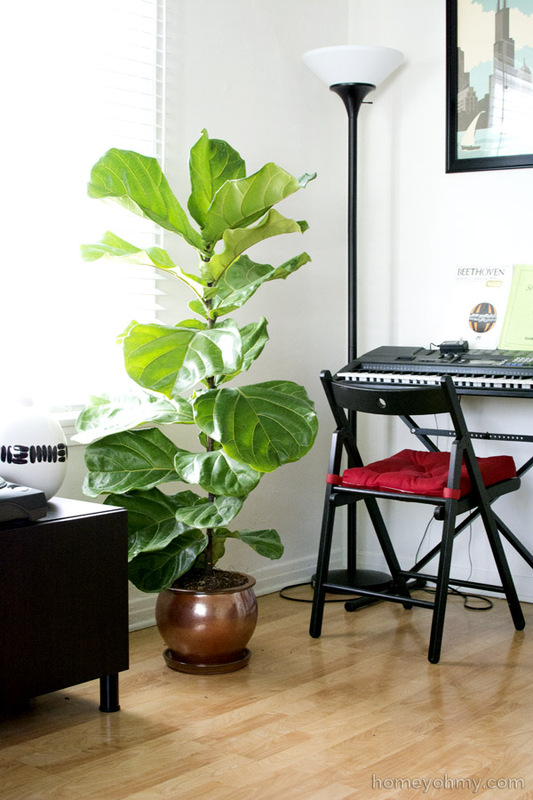 Love that you chose a Fiddle Leaf Fig Tree! You are going to enjoy it! I’ve owned a fiddle leaf for about a year now.. It’s my favorite plant and easy to care for. Mine is thriving, has grown about 26 new leaves, pruned twice. I live in Arizona so I fertilize often. In the winter I water 1/2 gallon every 9-10 days. In the summer I water everywhere 6-7 days. Natural light is everything. Keep it out of direct sun but in high light. Never above 90, never below 60.
and didn’t get watered. My husband cut all branches back about ten inches and it started to grow back. It is shorter, alive and beautiful!! I have a fiddle leaf fig and it joined my family of a 25-year-old cactus and a 16-year-old ficus and an 18-year-old Christmas cactus. They are all doing well. You’ll enjoy the fig (and you probably have by now). I don’t pay a lot of attention to the plants and that seems fine with them. I talk to them when I feed them or change them to a bigger pot. They are happy and so am I! I inherited one with FOUR stalks in one pot, way overgrown and leggy. I cut back all the stalks and have started a couple of new ones, and intend to separate the four stalks this fall. I love this plant but probably have been overwatering. It’s in the shade but outside and it’s been 100 degrees here. Next Next post: Washi Tape Pens- Guest Post at PBteen Blog!